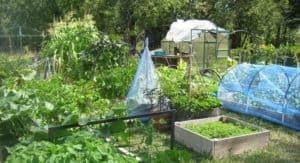 In the past few years, I’ve been really happy to see how many people have gotten interested in growing their own food. This interest in self-reliance is something that preppers, DIY-ers, homesteaders, hipsters, and activists can all share. 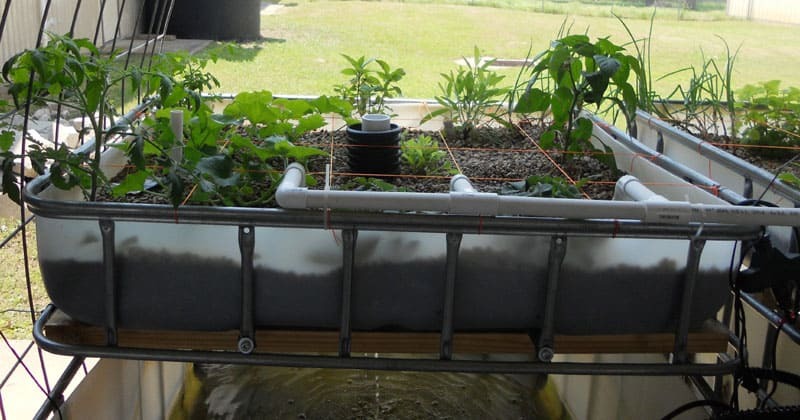 And what’s one of the best ways to grow food at home – DIY Aquaponics. This is a long and in-depth article, use the jump links below for quick navigation. What is an Aquaponics Garden? Aquaponics is a type of gardening where plants and fish are grown together. Many of the concepts are taken from aquaculture and hydroponics. However, aquaponics relies on the relationship between the fish and plants. You can’t have one without both working together in harmony. 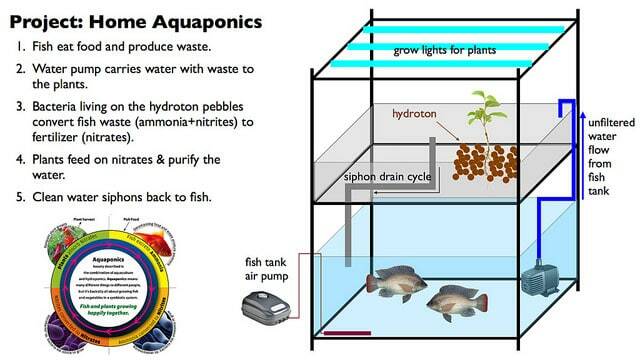 How do aquaponics systems work? It starts with the fish. The fish produce ammonia as waste. The fish water (and the waste in it) is pumped into a plant bed. Naturally-occurring bacteria and worms in the plant bed convert the waste into food for plants. In order for aquaponics systems to work, the pump needs to run several times per day. The fish also obviously need to be fed daily, and an aeration system must be constantly running to provide the fish with oxygen. Yes, there is a learning curve. However, you will find that aquaponics systems are a lot easier than most other food production methods – even traditional gardening. 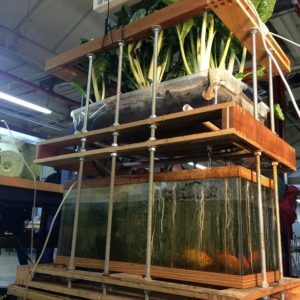 How does fish waste help plants to grow? Fish produce ammonia as waste. In a normal aquaculture operation, this ammonia must be removed as it is toxic to the fish. Ammonia is also toxic to plants, so how does it serve as food for plants? The key to aquaponics is the natural bacteria found in the growing bed (called the biofilter). The bacteria eat ammonia and turn it into nitrates, which are great food for plants. Without these nitrifying bacteria, the fish would die in their own waste. Without the nitrates, the plants wouldn’t have anything to eat. The beautiful thing is that the plants purify the water which goes through their growing bed, returning clean water to the fish. In this sense, it is a self-sustaining closed system. Water Friendly: The same water is reused. Only a little bit of water needs to be periodically added to account for evaporation. Since no water is lost through soil, it only requires about 10% of the water used in traditional gardening. 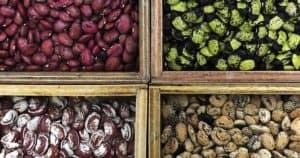 No Chemical Fertilizers Necessary: You don’t need any chemical fertilizers to grow food because the fish produce the plant food. Organic: It is organic by default because any herbicides or pesticides would harm the fish. No Back-Breaking Labor: Systems are usually set up at waist height, which means no need to bend over. Fast and Efficient Food Production Method: Once the system has been started, you can harvest food in an aquaponics garden very quickly. No Weeds: In an outdoor system, weeds might appear – but these can easily be plucked out of the medium. Healthy Food: In addition to growing plants for food, you also get fish (a great source of Omega 3). There is nothing like the feeling of self-sufficiency that comes with producing your own food! Year Round Operation: It is possible to do seasonal aquaponics. However, it takes time to develop the biofilter. To be effective, systems should be run year round – which means no break for you! Require Electricity: You need power to run the pumps. 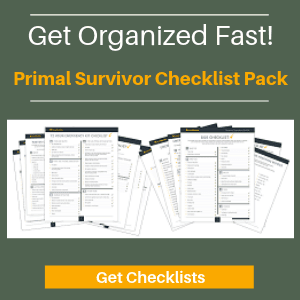 Power outages can destroy your entire system! You might want to consider a solar system. Fish Need to Be Fed Daily: You have some wiggle room with traditional gardens. With aquaponics, you don’t want to miss a single fish feeding. Not great if you travel often. 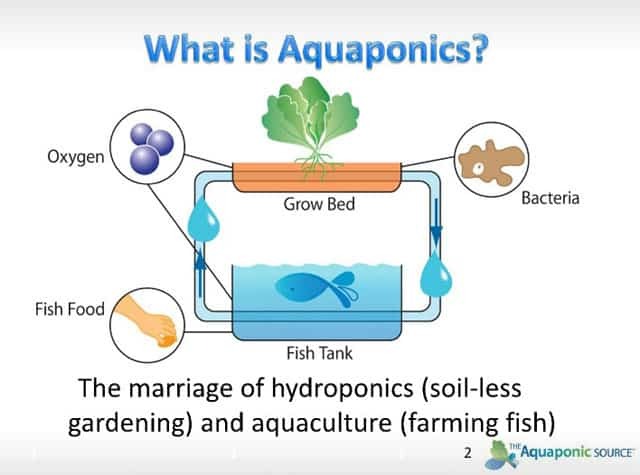 The “ponics” part of aquaponics comes from hydroponics. It means “grown without soil.” Instead of soil, the plants are kept in a bed of gravel or clay. The roots hang below in nutrient-rich, oxygenated water. 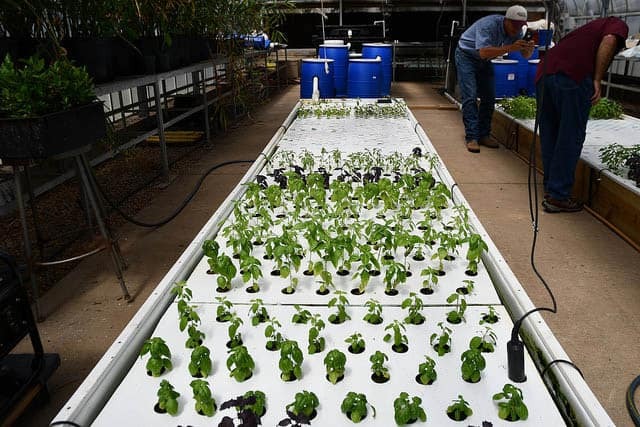 In a sense, the entire bed part of an aquaponics system is the same as a hydroponics system. They even use the same pumping and draining systems. However, the fish make all the difference with aquaponics. No need for expensive chemicals: With hydroponics, you need to buy chemical fertilizers for the plants. These can be very expensive. Aquaponics gets fertilizer naturally from the fish. 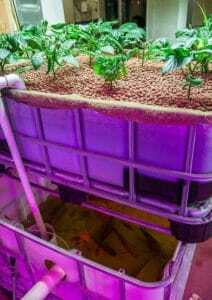 Uses less water: The water in hydroponics needs to be periodically dumped out to prevent buildup. Because water in aquaponics is cycled, it stays clean. 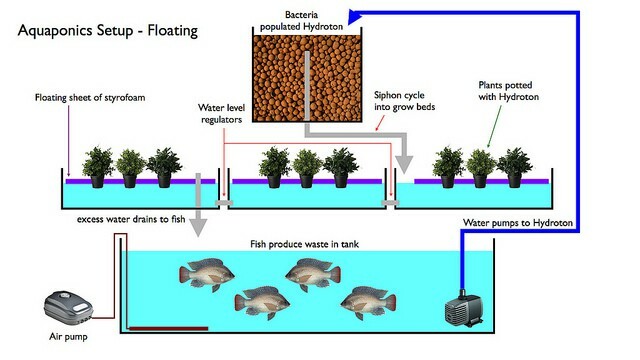 Easier: After you develop your biofilter (which admittedly can be tricky), aquaponics is much easier than hydroponics. You don’t need to check levels as frequently as with hydroponics. Fish for food: You not only get organic veggies but your own fish to eat too! The supplies you use can be as high-tech or low-tech as you want. I’ve seen some systems which were made completely out of salvaged materials. First, you’ll need a place for keeping your fish. There are a lot of different options for this. A lot of people start out with an aquarium. As they scale upwards, they might use things like plastic barrels, old bathtubs, or basins with pond liners in them. No Metal: Metal should never be used in aquaponics systems. The metal is corrosive, which means chemicals can get into your system. The metal will also throw off the pH of the system. 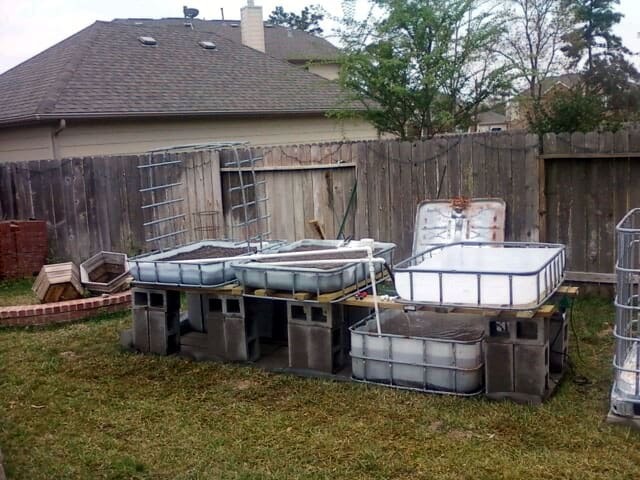 At Least 50 Gallons: It is possible to make an aquaponics system with a smaller tank. However, it’s a lot harder to regulate pH and temperatures in small tanks. You also won’t get any edible fish or much edible plants with such a small system. Choose a Round Tank: The reason round tanks are preferable is because they don’t have “dead zones” – areas where water doesn’t get circulated. Dead zones cause sediment buildup and have less oxygen. If you must use a rectangular tank, then you’ll have to periodically stir the water in it. Lots of things can be used for a grow bed. Usually plastic containers are used. You’ll need the grow bed to be at least 12 inches deep. The size of the grow bed depends on the size of the fish tank (more on that later). According to Sylvia Bernstein in her book Aquaponic Gardening, 12 inches is the standard depth of grow bed media. This provides enough depth to keep the plants anchored in place and enough surface area for the bacteria to thrive. The most popular grow media is Hydroton, a type of expanded clay, the original Hydroton brand is a highly recommended top quality clay from Germany. The cheaper option is expanded shale, don’t expect the same quality as Hydroton though. The plumbing of an aquaponics system is what circulates the water from the fish to the plant bed. If you are like me and don’t have any plumbing skills, it can be a bit tough to set up the plumbing. I highly recommend that you find a friend who does know plumbing to do it for you (and teach you during the setup process!). Setting up the plumbing isn’t just about getting the water circulating. You’ve got to make sure you are circulating enough of the fish water (so ammonia doesn’t buildup in the tank) without circulating too much water into the plant bed (and possibly drowning your plants). If you’ve ever had an aquarium before, then you know that fish need to have their water oxygenated. At oxygen levels of less than 3ppm, fish can become stressed. Levels lower than this can cause the fish to die. The easiest solution would be to buy an aeration device for your fish tank. However, this requires energy and money. Instead, you can make an oxygenation system as part of your plumbing. By poking holes in one of the pipes, you can cause some of the pumped water to drip down into the tank. The drips naturally aerate the water, sparing you from having to buy a separate aeration device. If you are lucky enough to live in a year-round growing climate and have an outdoors system, then you won’t need any grow lights. However, indoor systems will need lighting. Even greenhouse systems will often require supplemental lighting. There simply isn’t enough light in the winter for the plants to thrive. And, if your plants aren’t thriving, then they won’t be filtering the water which goes back to your fish! Unfortunately, grow lights can be very pricey to buy and run. They also produce heat, which could cause the system to overheat. You’ll have to carefully calculate lighting needs when designing your aquaponics garden. Finally, you are going to need some basic supplies for measuring pH, temperature, ammonia, nitrate levels, and chlorine. Cleaning your system is pretty easy. However, it helps to have some supplies like brushes and a mesh net or colander for cleaning media (it needs to be rinsed before adding it to your system). This testing kit is ideal. Accurately measures pH, nitrite levels, nitrate levels and ammonia. Even though I love the DIY aquaponics approach, I believe there is a lot of value in readymade aquaponics kits. These kits have been pre-tested, so you don’t have to worry that they will be sized incorrectly. You also have set instructions for the timers and pumps, so you know that the water will be circulating properly. Of course, these kits come at a high cost. They also don’t give you much flexibility in terms of sizing. Oh, and rarely do they even include the tank – so you are paying a lot of money for a plumbing and lighting system. If you aren’t sure about how committed you are, then consider buying a starter kit like the one below. You can analyze how the system works and use this info to design your own system later, if you so choose. This kit is known as the AquaSprouts garden and is a fully self sustaining aquarium and aquaponics kit. Fits any standard 10-gallon aquarium. If you are serious about growing your own food this way, then skip the starter kits. Instead, invest the money in a good course. 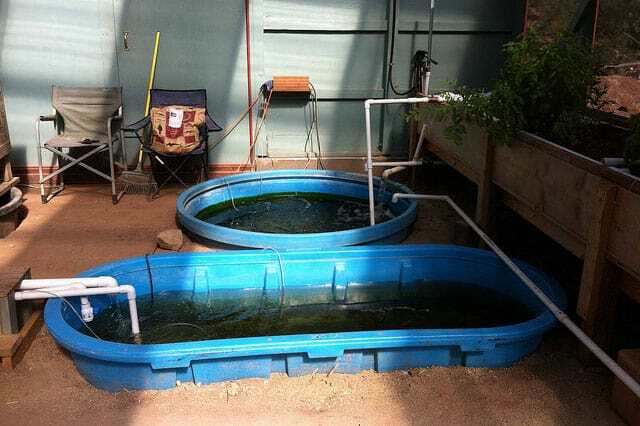 I talk about my favorite aquaponics course later in the article. Honestly, I find these lists completely useless. You’ve got to know why you are choosing a certain fish if you want your system to thrive! Obviously, if you prefer eating a certain type of fish over another, this is going to have a big impact on your choice (I hate the taste of catfish but love cod). But taste should really be one of the minor considerations when choosing your fish. Some fish are very sensitive to changes to their environment. Even a slight change in temperature or pH could cause the entire fish population to die. It is okay to use these sensitive fish – but I wouldn’t start your system with them. Wait until you get your system going and have learned how to regulate the water conditions well. Until you gain this expertise, start with hardy fish. Tilapia are one of the hardiest edible fish. Goldfish are also incredibly hardy. Goldfish are also cheap, so you won’t mind too much if your population dies during your initial trial-and-error phase. Regardless of the fish you choose, you will need an aeration system for your aquaponics garden. However, some fish require much more oxygen than others. As a general rule, fish found in ponds and lakes (where the water is more stagnant) require less oxygen. Fish that come from streams and rivers (where the water is constantly moving) require more oxygen. Consider where you will be keeping the fish and the temperature there. For example, if you live in Florida, the water temperature of your tanks could get very warm. Fish like tilapia and carp do well in warm climates. By contrast, Northern states could mean very cold water. Fish like trout and bass do better in these climates. Even if you plan on investing in a pricey heating system for the fish tank, remember that power failures do occur. Do you want to risk your entire fish population dying just because the power went out? This is something that beginner aquaponics gardeners often overlook when choosing their fish. The diet of the fish can affect your budget and how well the system functions. In general, fish can be broken down into omnivores and carnivores. Omnivore fish are easier to raise, not only is their feed cheaper (or free if you feed them table scraps), but they produce less ammonia. Carnivorous fish can be a bit tricky. They produce higher amounts of ammonia, which can make regulating the system difficult for beginners. You’ll also need to either buy expensive feed for the fish or raise your own grubs as food. One more thing: carnivorous fish often eat each other! If they aren’t happy with the food you provide them, don’t be surprised if your fish start killing each other off for food. If you are just beginning and don’t really care about eating fish right away, then I’d choose goldfish. They are cheap, easy to find, and thrive even in fluctuating conditions. If you want to start with an edible fish, then go with tilapia. They are very hardy, do well in most systems, and happen to taste great. If you have any experience with traditional gardening, then you probably know about soil pH and how it affects plants. While aquaponics doesn’t use soil, it does have its own pH. Ideally, that pH falls around 7. Plants which require a much higher or lower pH than this won’t do well. So, you can forget about growing acidic plants like azaleas or rhododendrons! You also need to remember that the plants in your garden will primarily be using nitrogen. Thus, plants that love nitrogen will do best. You can also grow plants like peppers, tomatoes and zucchini. However, these plants require a lot more nutrients and sunlight. I’d recommend starting with the easier plants and working your way up to these plants. What about root crops like potatoes and carrots? Yes, these technically can be grown. However, because aquaponics uses stone-like media instead of soil, you’ll end up with some weird, misshapen veggies. It is better not to plant these crops. 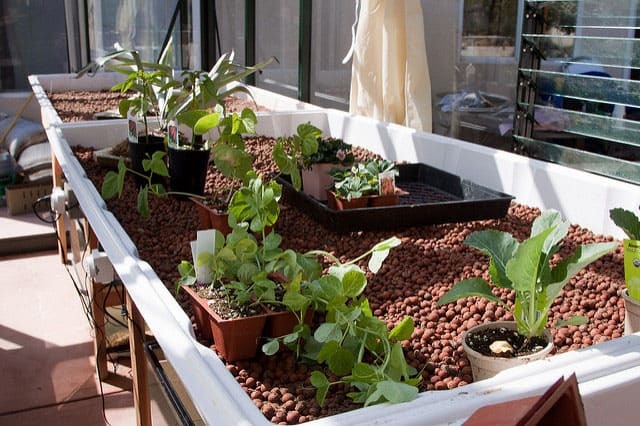 Here are the main things you’ll need to consider when designing your DIY aquaponics system! There are a few different types of aquaponic gardens that can be done at home. In almost all cases though, media-based systems are the best choice. These have a lower learning curve, are easier to set up, and are conducive to growing the most types of plants. ​With these systems, the plants are grown in a bed consisting of growing media. The plant bed can horizontal or vertical. It can be positioned above or below the fish tank. Most commonly, you’ll see horizontal systems where the plant bed is above or next to the fish tank. 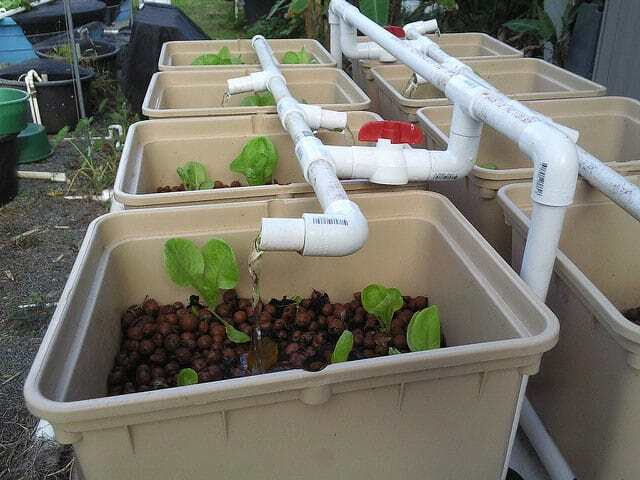 This system is common in hydroponics and can be used for aquaponics too. No media is used. Rather, the plants are placed in gutters. The name comes from the fact that only a small amount of water goes over the roots, or a “film” of water. Only plants with small root systems (such as lettuce) work in NFT systems. 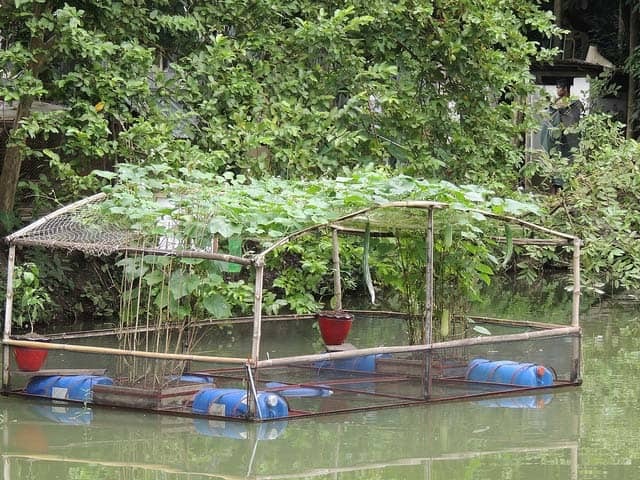 Also called raft systems, these work by floating the plants over the water. For example, the plants might be placed in Styrofoam which is suspended over the water. Some of the original systems – such as the floating crops in Bangladesh – work on this principle. Think very carefully about where you will put your DIY aquaponics system! Once it is set up, it can be very difficult to move. If you will need to move your system (such as bringing it indoors during winter), then you’ll have to factor this into the design – such as by adding wheels. If you live somewhere like Australia, Texas, Florida, or Southern California, then you could set up your system outdoors. It isn’t enough for the temperature to be warm enough for year-round plant growing. You also need the temperature to be fairly consistent so your fish can thrive. Those of us who don’t live in a year-round growing climate might be tempted to grow seasonally. However, I recommend against this. It takes a while to establish a biofilter. By the time you get your biofilter going, you won’t get that many harvests from the system – which takes away the efficiency benefits. Since growing seasonally is such a waste of effort, you might consider bringing your set up indoors during the cold months. Assuming that you plan your system so it is easily transportable, this solution works well. However, you will need grow lights and equipment for regulating temperature. For very small systems, indoor growing is easy and affordable. Once you start getting into larger systems, you will encounter problems. Systems are heavy! Make sure your floor can support the weight. Water spills are inevitable and could cause damage. This is the ideal solution. Not only are you able to grow year-round, but aquaponics is conducive to greenhouse growing. The water acts as a heatsink and provides the humidity required for greenhouses. Of course, this is all contingent on whether you have the space for a greenhouse on your property. You’ll have to build the greenhouse, get proper permits, and plan for water and power needs. 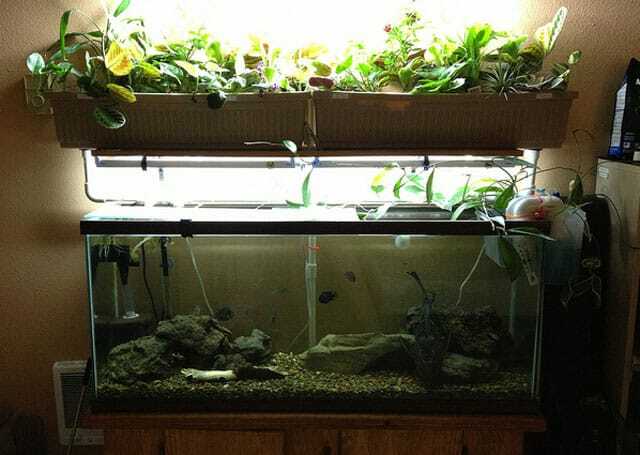 As mentioned before, you’ll want to have at least a 50 gallon tank for your fish. Ideally, you start with an even larger system. Larger systems are easy to regulate and have less fluctuation in temperature and pH. Even more important is the size ratio between the tank and plant bed. Sylvie Bernstein recommends that beginners start with a 1:1 ratio. Remember that we are talking about volume here, not surface area size. She recommends the 1:1 ratio because this ensures your system will be cycled properly. Once your biofilter is well developed and you’ve gotten some experience, you can start increasing your plant bed size. You can go up to a ratio of 1:4 (tank to plant bed volume). At this ratio though, you’ll need a more advanced system with sump tanks and indexing valves. Basically, you want to make sure that the water is getting cycled into the plant bed gradually. Otherwise you’ve got too much water getting into the biofilter at once, reducing its effectiveness. How many fish to include in your tank depends on the type and its feed. However, there are some general guidelines you can follow when designing your system. Remember that your fish will grow. Start with fewer plants when the fish are young, and add plants as the fish get bigger. I wish I could give you an exact price of how much building a system costs. Of course though, this varies a lot depending on your goals. I’ve seen pictures of set ups that were built for free from salvaged materials. Most people will at least need to buy a pump though. And, unless you are going to catch the fish yourself, you’ll probably be purchasing these. If you are really worried about the cost, then I suggest this: start with a small, self-built system. Use cheap fish like goldfish while starting out. The system will be too small to pay off (in terms of providing food). However, you will significantly reduce the costs associated with trial and error. While aquaponics is pretty easy, there is a learning curve. It is frustrating (and expensive!) when you lose an entire population of fish just because you couldn’t figure out how to regulate pH effectively! By starting small, you save yourself these inevitable losses. When you finally do scale up to a large garden, things will go smoothly. And those are the systems which can be very profitable – especially when you grow enough food that you can start selling it! Whew! If you’ve made it this far into the article, then I’m assuming you are serious about aquaponics. While this article is a beast, it doesn’t nearly cover everything you need to know. There is a lot of knowledge which goes into the initial phase, especially designing the system and building up the biofilter. You’ve also got to learn some tricks for maintaining the garden, such as what to do if the pH gets too high and how to check ammonia levels. I highly recommend the book and course by Sylvie Bernstein. Sylvie Bernstein is one of the leading authorities on aquaponics gardening. Her Book Aquaponic Gardening is very popular and well regarded. At nearly 300 pages, the Book covers everything from the philosophy behind aquaponics to details like pH, biofilter-building methods, insect control, worms, and troubleshooting. Admittedly, I do wish that the book had more pictures – but that’s where the eCourse comes in. After the success of her book, Sylvie decided to create an eCourse as a companion to the book. For people who do better with visual learning, the eCourse is a godsend. The course is broken down into 8 sections. These sections are further broken down into modules, for a total of 56 modules. Most of the modules are in video format, which is great because Sylvie actually shows you what to do. You get diagrams and visual info as she explains the concepts. This makes it a lot easier to grasp than simply reading the material. An interesting thing about the video format is that you actually get 2 screens to switch between. One screen shows the diagrams or list version of info. The second screen shows Sylvie (or her husband) as they explain the concepts. Another great thing about this course is that there is a Q&A section for each module. You can click on it to see what other students have asked. Or you can ask your own questions. There are some other good courses out there, but this one is my favorite so far. To get the most out of it, I do recommend buying both the eBook and the course. They were designed to be companions to each other, so you’ll grasp the content best with both resources. Consider the book and course an investment. You’ll plan your system better and make fewer mistakes, saving you a lot of time and money in the process! The eCourse is offered through Udemy here. CAN YOU PLEASE SIGN ME UP FOR YOUR NEWSLETTERS, AND CAN YOU PLEASE SIGN ME UP FOR SEND INFORMATION ABOUT YOUR ABOUT YOUR PRODUCT’S, BECAUSE I WOULD LIKE TO START GROWING MY OWN FOOD. Hi Jethro – have added you to the list. You should start receiving emails soon. This looks interesting to try, but it looks hard to build. Will have to ask my husband for help. Yes it is not the easiest system to set up but should run smoothly once in place. Interesting read. Would like to try this in the future. Thank you for the information. I’m going into my 5th year still trying to make my Aquaponic system produce vegetables. I can’t grow much. 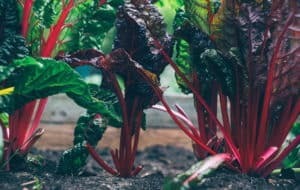 All of my vegetable plants whether by seed or starter plant are beautifully green with some flowers, but no vegetables. The water is crystal clear. The fish are healthy and fat (Gold Fish). The water quality is within all acceptable ranges. I don’t know what to do next. Any advice offered will be greatly appreciated. My garden only has 8 grow beds and they are about 15” deep x 40” wide X 48” long. Grow media are clay pellets. Water cycles 15 min. per hr. This is a flood and drain system. I have one 275 gal. fish tank above ground and one 275 gal. sump tank in the ground. The fish are fed once a day, in the evening. Only rain water is used. I’m looking forward to hearing from you. I started with a small garden. The whole thing was made using only two 55 gal barrels. 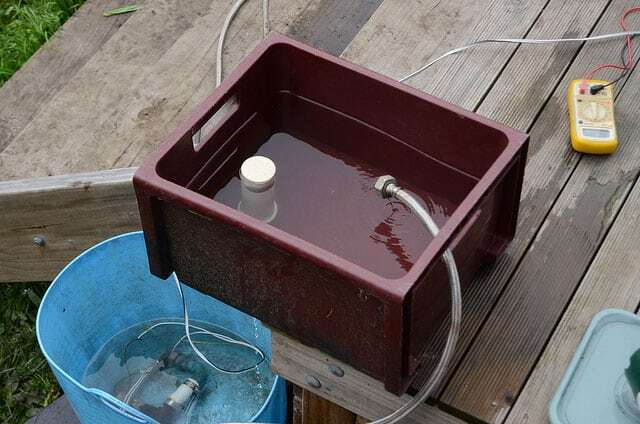 I had a single pump and a flood/siphon arrangement where the water would fill the growbeds, and I built a timer for the pump that would let it run long enough for the siphon to start and then shut off to drain the beds (there were two). Then it sat there for about 30 minutes (I was still learning). I bought about 2 pounds of goldfish frys and put them in there. That first attempt, to my complete amazement, rendered pounds of tomatoes, cucumbers and lettuce. A few green peppers and a few other things. It was amazing to see what it produced! I used that one through that summer, then scaled it up by using our storm cellar as a fish tank (It always filled up with water anyway so it was unusable) and I put my growbeds on top of it. Several versions later, I had a very workable system that I have used for several years now, using those same goldfish I had originally put in that first system! They grew! It wasn’t until the end of last summer that I had to go out of town on an emergency, and left the system with a tender to keep it while I was gone. One of the growbed drains stopped up and it overflowed and pumped all of the water out of the system and the fish died. My tender failed to check often enough. YOW! Still got food from it for a bit, but quality dwindled fast. I am getting ready to purchase about 100 or so bluegill to put in there and start it up again. I am also going to change the media from pea gravel (yes, pea gravel!) to a coarser media as the pea gravel gets rootbound easily. I am also hoping the higher number of fish will make it produce better and not get rootbound as easily. I am also going to add a settling tank to settle out solids prior to the water getting to the growbeds. This is one reason they get clogged up after a while. I don’t know what your system is not doing that mine is but you should be able to grow enough stuff to have some of it on a daily basis once it gets grown and producing. Remember that when the fish are small, they aren’t producing as much nutrient as when they get bigger so that may be one reason your garden didn’t produce much actual food. Try it again, man! I am sure you will get better results! Also, being a newbie when I first started I knew nothing about Ph testing, water/ammonia or nothing. Never tested any water or anything. I had just heard about aquaponics systems somewhere (at that time) andthrew together that first basic system. Even to this day, I have never tested Ph or anything. Not saying you shouldn’t, just I never have. I wil post some pics of my systems on my website when I find them and I hope I still have those of that very first system. Keep at it, man! You’ll get it! Hi, just a few pointers for the real “die hard” off the grid-ders” ;-). Instead of relying on electricity you can use a windmill to ‘send’ the fish-tank (or fish-pool) water up to the plants and then the gravity will take the water back down again. If there is no wind use a ‘bicycle-system’ for an hour. It’s a good exercise and you only have to do it about three times a day. Always remember that solar systems and batteries have a limited life-cycle, so in a shtf situation, you will eventually run out of that option. Yeah that would take it to the next level alright. Could be invaluable in a grid down event. Thanks. I think this is an informative post and it is very useful and knowledgeable. I really enjoyed reading it.